Ben Thompson Earns $12,000 Chess Scholarship. Benjamin Thompson is headed off to Lindenwood University this fall with a $12,000 scholarship from the school. Ben has been playing in WSCF tournaments for at least the last 12 years. Discovery World. Check. Golda Meir Tournament. Check. Northeastern Wisconsin Tournament. Check. Or should we say “Checkmate!” Those are just a few of the chess tournaments Benjamin Thompson has either placed first or second at over the many years he has devoted to learning and mastering the game since he began playing in 2007! Benjamin first picked up a chess piece while visiting the Chicago Children’s Museum with his mother. Mother and son boarded an Amtrak train to visit Chicago for a day and the rest, as they say, is history. His mother vividly remembers walking into a room at the museum that was designed as a life-size chessboard. It was there, under the guidance of two high schoolers that young Benjamin began to become inquisitive about chess. These two complete strangers spent hours with Ben introducing him to the pieces and the rules of the game. 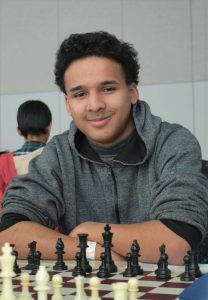 Now a senior and captain of the Rufus King International High School chess team, Benjamin’s passion for the sport has reached an all-time high as he prepares for the next level. With a WSCF rating of 1425 and a USCF rating of 1301, Benjamin will head off to college in August of 2019 to attend Lindenwood University in St. Charles, Missouri where he will join their chess team after having obtained a chess scholarship totaling more than $12,000. The Lindenwood Lions will not only be adding an excellent chess player to their team, but someone who has used chess to become a well-rounded individual. In addition to chess, Benjamin serves as a Link Crew leader at Rufus King, runs his own lawn care/snow removal business and has participated on the track, soccer and comedy improvisation teams at Rufus King High School.